Beach towels are a necessity in Southern California. Over the years I have been able to find some really cute towels at Target or Walmart. However, earlier this year I started following an amazing blog called Studio DIY. Kelly made some adorable DIY beach towels which inspired me to make my own. Little did I know how cheap it was to customize your own beach towel. The project took a bit of trial and error but now that I know what I’m doing I cannot wait to make more movie-themed beach towels. Right away I knew that I wanted to make movie beach towels. There were a few different ideas that came to mind when I was brainstorming. I started trying to think of the name of a movie that would make perfect sense on a beach towel. Finally, Some Like It Hot popped into my head and I thought it was a perfect fit! Plus, one of my favorite beaches to visit is the one at Hotel Del Coronado where Some Like it Hot was actually filmed. Other titles that could work are The Endless Summer or Wet Hot American Summer. You can always quote movies too like “See the line where the sky meets the sea it calls me” from Moana. One thing that I really love about this DIY project is that the possibilities are endless. Just because I like making movie themed towels doesn’t mean that’s what you have to do. Another fun idea could be to write “Reserved for Mom” or “Reserved for Elle” on the towel. You could gift someone customized beach towels for their honeymoon too. Newspaper – You can use something else but make sure to place something under the towel to help absorb the bleach. 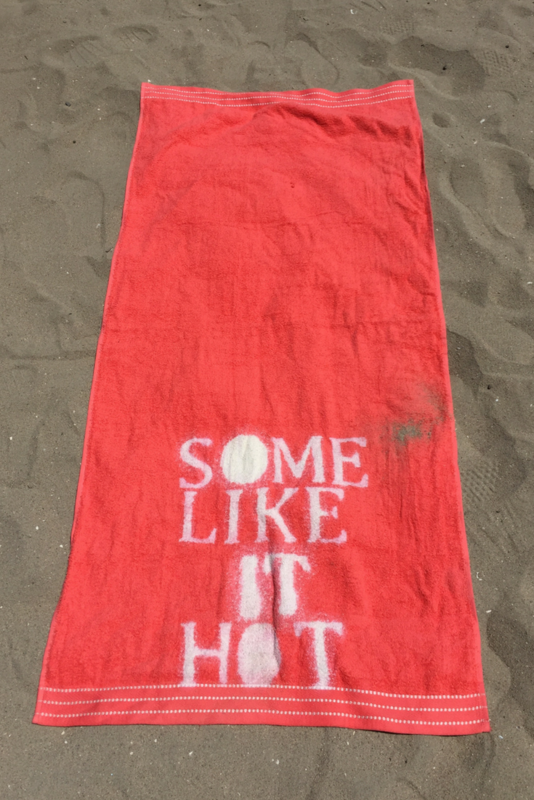 The first time that I attempted to make my own beach towel I printed out letters and placed them on the towel. To help the letters stay in place I used painters tape. Well, this attempt was a fail. If you simply use paper the bleach will soak through the paper and create one a big mess on the towel. You can see in the above picture how soaked the paper was after I sprayed bleach on the towel. So I threw that one out (thankfully it was only $3) and decided to try something else. I reprinted the letters, I used size 400 for the letters but you might want to use a bigger size. Using scissors I carefully cut out the inside of the letters. If you have words with an O you might want to keep part of the inside. I decided to make my O’s full. Once the letters had been cut out on paper I then traced the letters on cardboard. Using an xacto knife I then cut out the letters again on the cardboard. Unlike the regular paper, the cardboard is sturdy and thick enough that the bleach will not leak through. I added 1/2 bleach and 1/2 water to a spray bottle and sprayed through the cut outs in the cardboard. Within thirty minutes the towel was dry. I then put the towel in the washing machine so that I could get rid of the bleach smell. Are you looking for a great beach to check out in Southern California? Treasure Island beach in Laguna Beach is one of my favorites.